Available for: iPhone 3-6, iPod Touch, iPad and iPad mini and on Google Play for Android. Special offer: £2.99 on Apple and Android for the new term! 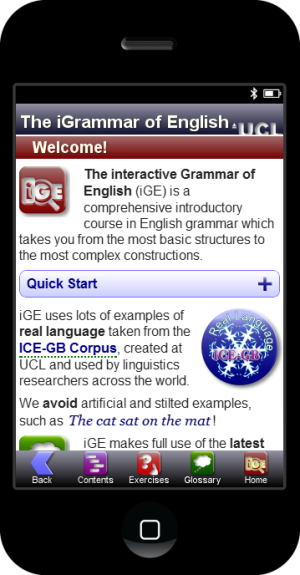 iGE is a complete grammar of the English Language, specifically designed for mobile devices. 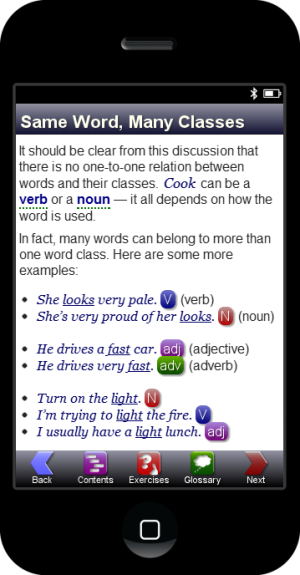 An extensive glossary helps you make sense of grammatical terms. A guided course takes you through different concepts in turn. Interactive exercises and puzzles aim to reinforce learning and make it fun. 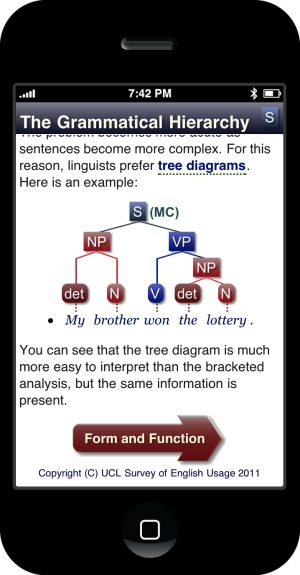 Unlike other grammar Apps, we cover the entire grammar of English. iGE Lite is free. It has a complete glossary, and three units of course material covering word classes, nouns and determiners. The complete iGE is on sale for £2.99. Go to the App Store or Google Play StoreTM and search for "ige grammar", or click on the links below. The interactive Grammar of English (iGE) is a comprehensive introductory course in English grammar which takes you from the most basic structures to the most complex constructions. iGE is an authoritative guide to the structure of the English Language specifically designed for mobile devices to meet the needs of busy teachers and students. iGE uses lots of examples of real language taken from the 1M word ICE-GB Corpus, compiled and analysed at UCL and used by linguistics researchers across the world. iGE is written by a team of linguists at University College London (UCL), independently ranked as one of the world's best Universities. The grammar you'll be learning is based on recent research and best practice in the field. The iGE course covers the same ground as a first year undergraduate course in Modern English Grammar. But that does not mean it is difficult to follow! We have written iGE to be accessible, with clear explanations, colourful notation and lots of examples. iGE is for everyone with an interest in the grammar of English. and many more topics along the way. Creating iGE was an exercise in miniaturisation. We cover the same range of topics found in a heavy grammar book, typically costing five times the price or more, and squeeze it into your device. We have simplified the presentation to make it easier to read, and exploited the capabilities of the device. A complete grammatical glossary: a searchable A-Z of grammatical terms. 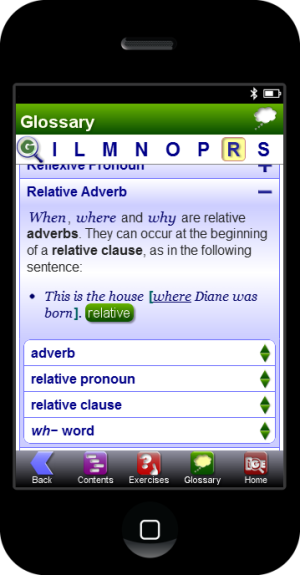 The interactive Grammar of English is extensively cross-referenced via the glossary. Grammatical terms are highlighted throughout the course with a dashed green underline. Tap on one and you get the definition of the term, links to other related definitions, and a list of pages in the course explaining it in more depth. Many interactive exercises and quizzes to test yourself. 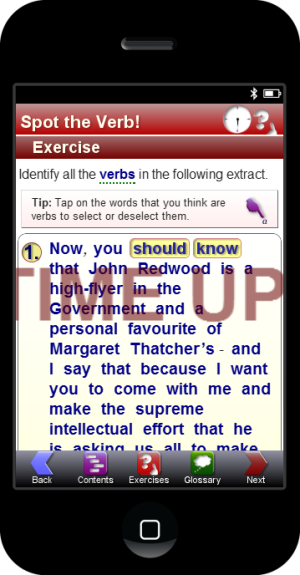 Our exercises use hundreds of real English examples. You can try an exercise again to get new examples. Exercises can be timed, and for a real challenge, played against the clock. Aarts, B. and Wallis, S.A. 2011. The interactive Grammar of English. London: Survey of English Usage / UCL Business PLC. Aarts, B., Clayton D., and Wallis, S.A. 2012. Bridging the Grammar Gap: teaching English to the iPhone generation. English Today 28, 1: 3-8. » ePublished : English Today © 2012 Cambridge University Press.